For those of you that haven’t hear of the Continuum Concept, it is an idea, coined byJean Liedloff in her 1975 book called “The Continuum Concept: The book is based on the premise that human beings are born with an innate set of expectations, which Liedloff calls “the continuum”. She believes that our evolution has destined us as a species to achieve optimal physical, mental, and emotional development and adaptability, naturally. Liedloff, spent two and a half years deep in the South American jungle with a group of indigenous people. The experience demolished her Western preconceptions of how we should live and led her to a radically different view of what human nature really is. She offers a new understanding of how we have lost much of our natural well-being and shows us practical ways to regain it for our children and for ourselves. The book is not written as a child-rearing manual, The Continuum Concept has earned a reputation as an excellent resource for parents and parents-to-be who intuitively feel that the parenting “techniques” of the modern era are inherently misguided. It has also been helpful to many adults — parents and non-parents alike — who hope to recover the natural state of happiness lost as a result of the modern child-rearing practices of their well-meaning parents. Scott believes that children are innately good and that a natural, partnership style of parenting is the best way to foster their goodness. He teaches parents how to avoid coercive parenting methods by focusing on four positive pathways to power — Partnership, Authenticity, Trust, and Heart — an approach he calls PATH Parenting. 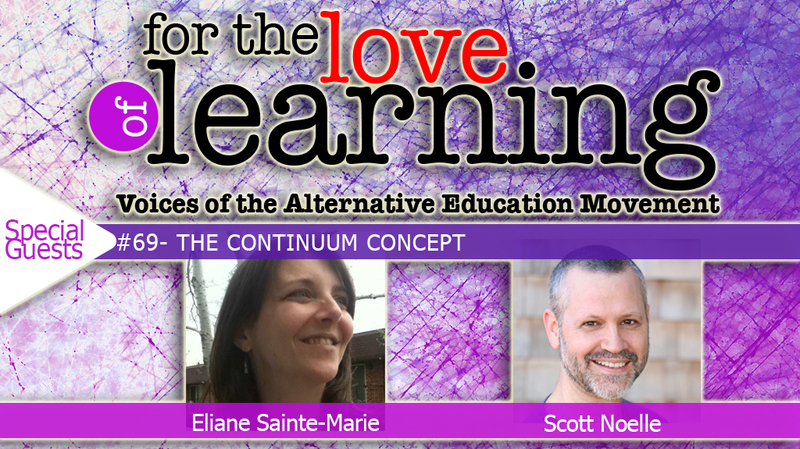 As an advocate of homeschooling and self-directed learning, Scott is on the board of directors of the newly formed Alliance for Self-Directed Education (www.self-directed.org). He lives in Portland, Oregon (USA), with his partner Beth Noelle and their two teenage children. Eliane Sainte-Marie helps parents take peaceful parenting from beautiful theory to day to day reality in their families, She is passionate about sharing her message that parenting CAN be easy so more parents may commit themselves to it, and is a living proof that it can be, having experienced it with her 3 now grown daughters. She’s the creator of the Clean Parenting™ Program, a transformational journey that that connects parents to their instincts and their children’s innate goodness, and effectively supports them in living in their families the ease and harmony that Eliane promises is possible. She’s the author of the upcoming book: Clean Parenting: The peaceful parent’s essential handbook. She’s also working on a book titled Applying The Continuum Concept Parenting Philosophy To Modern Day Living. You can find her article by the same title, which has been called the missing chapter from the book, on the Continuum Concept page of her website. Eliane read TCC in 1994 where her oldest daughter was 2 years old, after reading dozens of parenting books, and never read another one after that. She just went to work figuring out how the heck to apply this approach to parenting into her American suburban life. And she’s thrilled with the results, having now 3 thriving, unencumbered adult daughters who all have a healthy and strong sense of self. She founded Parenting For Wholeness in 2013 for two main purposes: The first is to support parents in also having ease and harmony in their families while ensuring that their children grow up whole. The second is to help parents heal from their childhood baggage so they can parent in alignment with their values and also live from a place of wholeness, peace and happiness.